We’d love your help. Let us know what’s wrong with this preview of Trusting the Currents by Lynnda Pollio. Author Lynnda Pollio’s life as a busy New Yorker abruptly changes when she unexpectedly hears the mystical, elderly voice of Addie Mae Aubrey, a Southern, African American woman. Her first words, “It’s not what happened to me that matters,” begin a spirited remembering of Addie Mae’s teenage years in the late 1930s rural south and Some moments change everything you become. To ask other readers questions about Trusting the Currents, please sign up. I should start by saying that I received this book as a Goodreads giveaway. And, I am so glad that I did! This book was a total delight and I want to read it all over again. I don't think it right for me to give a review of the storyline, as I don't want to steal anyone's joy as they read the book. But, do yourself a favor, read this book and experience what I think was pure magic! Lynnda Pollio - Thank you for giving readers such a wonderful book to read! This novel was straight soul food! I am so excited to tell you about it. It's like nothing I've ever read before in fictional form. Trusting the Currents is a brilliantly conceived novel in which the author channeled the spirit of her character onto the page. And what a beautiful story she had to tell! Addie Mae is struggling to find herself in a way that I think all women could relate to: how to separate what the heart wants from what the soul is destined for, how to let go of the ones we love This novel was straight soul food! I am so excited to tell you about it. It's like nothing I've ever read before in fictional form. Trusting the Currents is a brilliantly conceived novel in which the author channeled the spirit of her character onto the page. And what a beautiful story she had to tell! Addie Mae is struggling to find herself in a way that I think all women could relate to: how to separate what the heart wants from what the soul is destined for, how to let go of the ones we love so tenderly--not only to live our lives to the fullest but allow them to as well--, how to make peace with one's spirit and find consolation with nature and God without dependence on others. The story is unusual but exciting. The ending is open in a certain way but then again not so much. I have to admit that I was pretty sceptical towards this book at first, because I don’t really read that kind of genre usually. I was pleasantly surprised by this book and recommend it to my friends. There are no clichés and the story is told effortlessly. The plot is very emotional, so keep the tissues ready. Sometimes the plot is a bit slow but never really boring. The characters are amazing and The story is unusual but exciting. The ending is open in a certain way but then again not so much. I have to admit that I was pretty sceptical towards this book at first, because I don’t really read that kind of genre usually. I was pleasantly surprised by this book and recommend it to my friends. The characters are amazing and all have flaws, which shine brightly throughout the story. But these little things make them adorable and you can’t not be sympathetic with them. Every person has its story and by learning they show new fascinating facets of themselves. The only things I would have liked would have been a few more details about the uncle and his drinking problem. After the descriptions you can imagine the village very well. Although the persons are quite religious and I’m not, I could learn a few things from them and understand their point of view. The description in general are sometimes somewhat childish or nearly naïve, but since you hear about a kid growing up, it’s ok. Luckily unnecessary things were left out, so the book isn’t bloated. The emotions were beautifully written and made you think about these events. The length of the sentences varies in a nice way and creates a pleasant reading flow. Not to forget the little bonus for the nice cover. I really like it! DNF on page 107. Not my kind of book. Writing isn't bad, just not my kind of story. At a time when many are awakening to their own spiritual paths, Addie Mae’s story will resonate with those ready to hear her Trusting The Currents is a form of conscious storytelling. It is the story of two women: Lynnda Pollio who reached a point in her life when she was ready for a spiritual journey, and Addie Mae, a Southern African-American woman who chose to speak about her own teenage life through Lynnda. Addie Mae’s own story is about self-discovery and her strength to break away from the small town expectations. But this is much more “It’s not what happened to me that matters.” She tells Lynnda at the outset. This book will be about what each reader can take from it: messages, lessons and inspiration may resonate with readers. This book was full of meaning for me, and I thought about it a great deal, afterwards; I've been excited about spreading the word to others, and hope you will take as much from it as I did. Trusting the Currents is a remarkable novel. It was originally sent to me by Lynnda Pollio for consideration in my Go Indie Now! Bibliotherapy Box, and I immediately knew that the book would change my life. Through this book Pollio has created a new genre of Visionary Fiction, and embedded in the writing are energetic frequencies that help to expand the reader's consciousness. Reading a novel should always be an experience, and Pollio's writing has taken it to the next level. I connected with Add Trusting the Currents is a remarkable novel. It was originally sent to me by Lynnda Pollio for consideration in my Go Indie Now! Bibliotherapy Box, and I immediately knew that the book would change my life. Through this book Pollio has created a new genre of Visionary Fiction, and embedded in the writing are energetic frequencies that help to expand the reader's consciousness. Reading a novel should always be an experience, and Pollio's writing has taken it to the next level. I was incredibly moved by Trusting the Currents- Addie Mae represents the spirit in all of us. The whisper in our soul, driving us to push beyond our realms of comfort. Our heart breaks with her many times throughout the story, and like many "classic" narratives before it, it is discretely, then quite epically stitched back together as the story reveals its final lessons. Addie Mae wasn't looking for answers and neither should we, she was looking for her confidence to grow enough to take that fi I was incredibly moved by Trusting the Currents- Addie Mae represents the spirit in all of us. The whisper in our soul, driving us to push beyond our realms of comfort. Our heart breaks with her many times throughout the story, and like many "classic" narratives before it, it is discretely, then quite epically stitched back together as the story reveals its final lessons. Addie Mae wasn't looking for answers and neither should we, she was looking for her confidence to grow enough to take that first step in the direction of her dreams. And she did it with the support of her community. I cried (many times), I cheered, and perhaps most surprising of all, after I finished I wrote my mother a letter thanking her for all she's done for me. Trusting the currents brought her and I closer together just as Addie Mae brought me closer to myself. Part internal monologue, part mystical, part coming of age story. Well written and crafted, the path to wisdom is found in family, in crisis and in communicating with nature. A pleasure to read and savor. 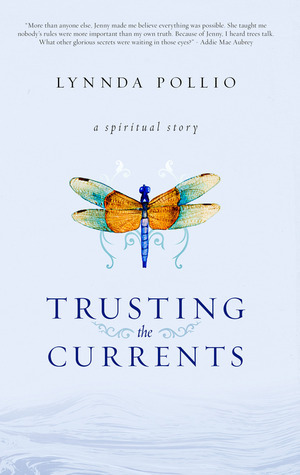 We are proud to announce that TRUSTING THE CURRENTS by Lynnda Pollio is a B.R.A.G. Medallion Honoree. This tells a reader that this book is well worth their time and money! One of the most moving, amazing books I have ever read. Addie Mae will touch your heart and teach you, and move you to tears with the power of her words. Bravo! A story within a story, Trusting the Currents begins and ends with Lynda Pollio at a tipping point in her life but the main focus and heart of the story is Addie Mae and her tale of learning, growing and opening oneself to the world. Addie Mae’s story of family, love, and leaving the nest is simply told and full of warmth and life. In the Aubrey family tree, Addie Mae’s mother is both the roots and trunk, nourishing them and keeping them anchored to their history; Addie Mae is the branches, reaching up and outwards towards the sun, the sky, the horizon; and Jenny is the leaves, attached but apart, changing and turning as the breeze catches her. All three women have wisdom to impart and there are life lessons to be reaped in their words and experiences throughout the story. They face adversity with great strength and grace, and embrace their blessings with an open joy that is infectious. The basis of the story is deeply spiritual/religious, but it can be enjoyed by readers of any faith or belief, as the soul of the book is in the human experience and how we stand together to survive it and grow within it. I recommend this to those who like slow-paced family stories with a warm, giving heart. There aren’t very many books that I read that cause me to pause and reflect on my own life, but this book did. There is so much about this wonderfully written book that is thought provoking. For anyone not sure about what path to take in life, this story may be the nudge needed to move them forward. The story flows beautifully and I found it easy to latch on to the characters. Each character is described in a fashion true to life, and easy to like, hate, or relate to. I really enjoyed this read, a There aren’t very many books that I read that cause me to pause and reflect on my own life, but this book did. There is so much about this wonderfully written book that is thought provoking. For anyone not sure about what path to take in life, this story may be the nudge needed to move them forward. This review has been hidden because it contains spoilers. To view it, click here. This book truly shocked me. It was written by Lynnda Pollio and I thought it would be a mystical, spiritual book but it was an interesting book about a young black girl growing up in the south. Actually I enjoyed the book much more than I thought I would. 3.5 stars....I enjoyed this story because I could relate to much of it, and there are some profound quotes, but it did seem wordy in the message. I had no idea where I might be going when I opened this book. I had been drawn to it by the cover picture of the dragonfly, to me a great symbol of wisdom. The author, Lynnda Pollio, invites into the magic of change on a cellular level. My understanding of magic is that change of perception that happens even if we are unaware of it until something changes with and within our understanding. Now, I could get all Jungian and talk about symbolism in water and wind and light, but that is for another t I had no idea where I might be going when I opened this book. I had been drawn to it by the cover picture of the dragonfly, to me a great symbol of wisdom. The author, Lynnda Pollio, invites into the magic of change on a cellular level. My understanding of magic is that change of perception that happens even if we are unaware of it until something changes with and within our understanding. Now, I could get all Jungian and talk about symbolism in water and wind and light, but that is for another time and place. The story of Addie Mae Audrey is as wonderful as Walker's story of the Color Purple. We are let into a life on the cusp of understanding the greater good and God's messages and messengers as one part of the journey is ending and another beginning. All of her messengers are tangible until God sees that she is open to understanding the gift of being open, and shedding the shackles of life as we are presented. We often need to be peeled away to hear our next call, our next understanding. Lynnda Pollio is honest about her own burnout stopping up her life and how in clearing it, she to could return changed by the haunting story of Addie Mae, someone she woukd have paid no attention to in NYC. As an ordained minister, my personal theology resounds with the theologian H.Richard Neibuhr, who says if we are true to our calls, we first must remove ourselves fron the bustle of the world to hear our true selves. And then, we are compelled to return to our lives and present them through the magic of God. 10 thought the cover was excellent. 7 thought the setting was the best part of the book. 6 felt the writing style was a little slow in parts. I don't own many books. Once I've read a novel, even if I enjoyed it, I tend to give it away. It's rare that I hang on to fiction books to read again. Trusting the Currents is different. It's a story with believable characters, evocative descriptions and an authentic narrative voice which drew me in to Addie Mae's world and kept me up until late at night turning the pages. But it's more than that too. There's a depth about this book that makes me want to read it a second time - more slowly - to I don't own many books. Once I've read a novel, even if I enjoyed it, I tend to give it away. It's rare that I hang on to fiction books to read again. Trusting the Currents is different. It's a story with believable characters, evocative descriptions and an authentic narrative voice which drew me in to Addie Mae's world and kept me up until late at night turning the pages. But it's more than that too. There's a depth about this book that makes me want to read it a second time - more slowly - to immerse myself in its time and setting and the wisdom and insights it contains. A much needed, consciousness-raising, beautifully written modern day parable. It has been said that a parable is an earthly story with a heavenly meaning. Sages through the ages frequently used parables as a means of illustrating profound, not easily understood, universal truths. I've personally long embraced intuition and coincidences as natural phenomena, but could never easily explain why. Lynnda Pollio can. She has a divine gift of being able to make deep, universal truths resonate with the co A much needed, consciousness-raising, beautifully written modern day parable. I've personally long embraced intuition and coincidences as natural phenomena, but could never easily explain why. Lynnda Pollio can. She has a divine gift of being able to make deep, universal truths resonate with the core of your being. She is a parable teller par excellence, and 'Trusting the Currents' is a gem of a book. This book is a must read. Lynnda Pollio writes in a way that truly speaks to our soul. She takes us deep into the characters in the story and calls us to think and possibly change the path we are on. Through Addie Mae, we learn more than the words written can say. If you enjoy reading books, then this one will speak to you. If you enjoy being captured by an engaging, troubling story, then this one will speak to you. If you want to understand how characters in a story can change lives (good and ba This book is a must read. Lynnda Pollio writes in a way that truly speaks to our soul. She takes us deep into the characters in the story and calls us to think and possibly change the path we are on. Through Addie Mae, we learn more than the words written can say. If you enjoy reading books, then this one will speak to you. If you enjoy being captured by an engaging, troubling story, then this one will speak to you. If you want to understand how characters in a story can change lives (good and bad), then this one will be one to not miss. t's rare that a story transports and transforms. Equally rare when you find yourself racing to find out how it will all turn out at the same time you never want the story to end. But that's what happens in Trusting the Currents. The author calls the story of Addie Mae Aubrey a "new genre of conscious storytelling." I call it brilliant and a highly recommended read! This book is brilliant! I can't say enough about the wisdom that unfolds and the potential that sparks within. You'll find yourself at "home," and at the same time, you'll travel with Addie Mae to the outskirts of soul. While she reveals herself to you, you can't help but uncover unfamiliar thread of your own existence. If you revel in the beauty of love, the mystery of spirit, the courage of soul, and the alchemy of relationship...Read. This. Book. This was a good story, but I found it a little long-winded. I skipped over some of the portions of the book that felt like messages to the reader. But the book is not heavy-handed, and it was easy to enjoy, in spite of being a bit message-y. This book is the most beautiful one I have read in a very long time. Not only is it equisitely written but also there is a wealth of real wisdom in its pages. The very act of reading it is somewhat akin to a spiritual experience. Loved the book: Jenny was my favorite character and the different voices really rang true for me. I was particularly drawn in by the first few chapters and found the book hard to put down. I read Trusting the Currents again and got so much wisdom from it. This is a story for our souls. It touches your very essence and makes you feel deeply about life. So grateful for it that my mantra in life now is trusting the currents. Such a beautiful book - the depth and flow of this story make it gorgeous to read. I would love to see more from this author. This was a little wordy, I believe some editing would be beneficial. The story itself is heart warming but a little too preachy for my taste. Worth the read...give it a try. I never expected to be a writer until I heard the mystical voice of Addie Mae Aubrey, a Southern, African-American woman asking me to tell her story. Together we shared an amazing journey through space and time that transformed my life forever. Trusting the Currents has won 12 literary awards and continues to find readers who will resonate with its wisdom and guidance. Born in rural New Jersey, I I never expected to be a writer until I heard the mystical voice of Addie Mae Aubrey, a Southern, African-American woman asking me to tell her story. Together we shared an amazing journey through space and time that transformed my life forever. Trusting the Currents has won 12 literary awards and continues to find readers who will resonate with its wisdom and guidance. I have always been deeply committed to elevating human consciousness. This life purpose has guided me as an accomplished advertising executive, as a consultant and thought leader in conscious business practices, and as the world’s first Chief Consciousness Officer, supporting Fortune 500 companies by helping them engage the human technologies of wisdom, intuition, compassion, empathy, forgiveness and gratitude. Currently, as a writer and consultant, I continue to connect people with the universal truths that lie within their hearts.